At the Ukrainian Catholic Synod of Bishops, now underway in Ukraine, a young bishop from another Eastern Catholic Church – the Syro-Malabar Church – spoke to the Ukrainian Catholic Bishops about the experiences in his church in his part of the world. 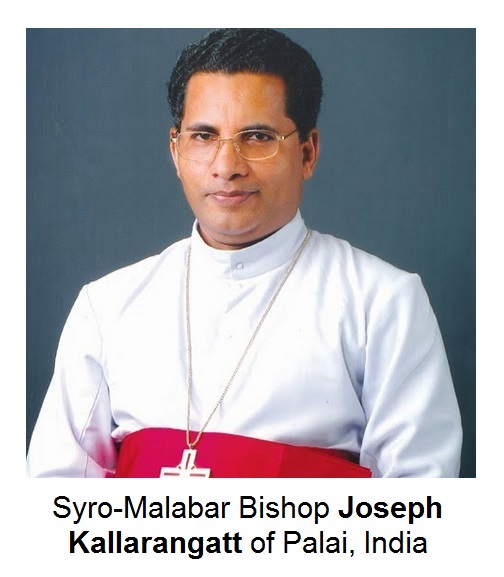 Bishop Joseph Kallarangatt is the Eparchial Bishop of Palai in India, one of 35 eparchies and exarchates around the world – including Canada. The Syro-Malabar Church, the second largest Eastern Catholic Church after the Ukrainian Catholic Church, was founded by the Apostle Thomas in the year 52 AD. This is why to this day, they are among those that are often referred to as the "Thomas Christians".The Father and Head of the Syro-Malabar Catholic Church is His Beatitude George Alencherry. Bishop Joseph shared with the Synod Fathers various expressions of “diakonia” (i.e. ‘service’ or ‘ministry’) in his Syro-Malabar Church. He explained that the Church, first of all, deals with the downtrodden, by defending the rights and dignity of the poorest and of the lowest castes in Indian society, referred to as “Dalits”. Bishop Joseph went on to explain that the next most important ministry that his Church offers in the area of diakonia is the homeless and the faith community strives to find them housing. Thousands of building were built around India for this purpose. They also attend to those with mental and physical challenges and don’t have the means to seek medical and therapeutic attention. They also help especially the poor to obtain an education. This Syro-Malabar Church alone provides over 2000 clinics and hospitals to tend to the infirm around the country. They also provide pastoral care for prisoners. A fraternity that calls itself the Jesus Fraternity was formed 25 years ago to minister to the prisoners. The number of repeat offenders, of course, has dropped as those jailed are given hope and friendship. The Church, in its “domestic” mission promotes the wholeness and sacredness of family life. One effort sees small groups of religious Sisters dispatched to every parish. There they make it their mission to get to know each family in that parish and how every member of that family is doing. They assist in whatever way they can. He described their outreach to those struggling with drug and alcohol dependencies. There are Bible study groups and other organizations in every parish. The Church organizes “Bible Conventions” every year that lasts between 5 and 6 days. This is always attended by thousands. At the end, he stressed the importance of ecumenical outreach. A diakonia of ecumenism and inter-religious collaboration is essential if ministry/service is to achieve its full potential. Churches serve only their own interests and their own people to their own detriment, because they ultimately isolate themselves. Among the number of people who also spoke – so far - at the Synod was the President of Caritas Ukraine, Mr. Andrij Waskowycz. The charitable organization that he heads is well-known in Ukraine for its tireless assiatnce to all the needy in Ukrainian society. Next report….